Living or travelling through Western or Central PA means you're familiar with Marcellus Shale fracking. Many have weighed in on the environmental effects of fracking, but you may not be aware of another potential danger: truck accidents. Semi trucks and tractor-trailers are constantly hauling sand, water, and other chemicals to these massive drill sites. 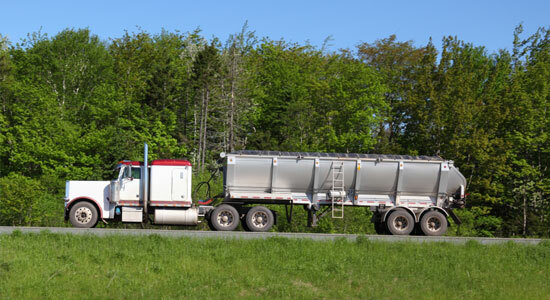 These trucks are required to take back roads to reach the undeveloped areas suitable for drilling – roads not meant for the heavy traffic associated with semi trucks. Weighing over 40 to 50 tons, these semi trucks and tractor-trailers are driving on roads not meant to accommodate their weight and size. Driving big trucks along these country roads and back lanes is putting truck drivers and motorists at risk. Washington County has over 800 Marcellus Shale wells, Greene County has over 550, Westmoreland County has over 230 – the list goes on. While these truck drivers are professionals, it's impossible to account for roads that were never designed to withstand the punishment of semi truck traffic. If you combine improper roads with tight fracking deadlines, large equipment loads, and other motorists, it's a recipe for disaster. Massive trucks, big rigs, and semis can cause serious damage when they're involved in an accident. Even the best, most careful drivers can still be involved in an accident. Our law firm has been handling truck accidents for over 35 years. We have the resources to fight large fracking corporations and massive insurance companies that want to squash your injury claim. Don't fight them alone. We can help. Contact us a for a free legal consultation at 1-866-943-3427 or simply complete the form in the top right corner. Chat with one of our representatives by clicking on the box in the bottom right.